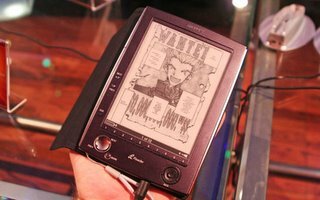 Sony recently introduced a new e-book reader at the 2006 Consumer Electronics Show (CES) show this past week. Unlike many of its predecessors, Sony feels that this new reader may be just the device to make e-book reading really take off. Reviews of the new reader boast a "paper-like" viewing screen and the ability to view more than books (pdf documents, newsfeeeds, blogs, jpg pictures and even allows you to listen to audio files). Take a tour of this new device yourself online. That's really cool. I can't wait to get one! Check out this a $100 laptop with a hand crank for power. The group is One Laptop per Child and they want to get laptops to every child in the world as if they were textbooks.